Speedway Motorsports chairman Bruton Smith told reporters in attendance at last week’s Media Tour that he wanted NASCAR to do something to end the practice of teams starting and parking in races. He also appealed to NASCAR to reduce the top speeds of race cars, using the argument that racing would be safer and drivers would put on a better show because they’d be more likely to make bold moves at slower speeds. Smith’s thoughts on the speeds are spot-on. His thinking on the practice of starting and parking doesn’t address the whole issue. The current pay structure offers little incentive for teams with limited sponsorship to race hard every week and tends to reward those who start and park. In the season finale at Homestead last year, Mike Bliss finished 43rd, dropping out with “electrical” problems after running just 16 laps. He earned $62,429. David Ragan ran the whole race, collecting $67,235. 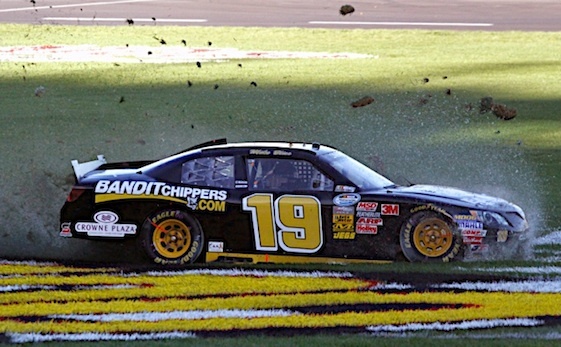 The difference likely wouldn’t cover the tires Ragan wore out, let alone the wear and tear on his car. If NASCAR did decide to put a pay structure or other rule in place to eliminate starting and parking, what about the teams that are starting and riding, that is running the whole race without putting forth a potentially winning effort? They’re basically taking start-and-park up a few notches. Their motivations most likely are run good enough to attract more sponsorship so they can race harder while also garnering enough points to be assured of a starting spot for upcoming races. While some do appear to be abusing the payoff system by starting and parking, it’s a good bet that even those drivers and owners would be racing for wins if they could make the numbers work. What about the people behind some of the “back marker” teams. 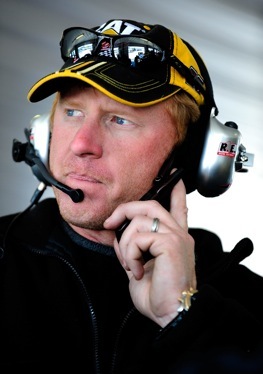 Take Tommy Baldwin Jr. Only a knucklehead would question his desire to be a winner, but in four years as a car owner, the former Cup-race-winning crew chief has an average finish of 32.6. Frankie Stoddard, like Baldwin a Cup-race winner as a crew chief, has been a Cup car owner for two seasons, but his cars have an average finish of just 30.2. Interestingly, the two places where even the usual start-and-parkers make a run at the checkered flag are Daytona and Talladega, where restrictor plates tend to make everyone a potential winner. Baldwin’s driver Dave Blaney has been in position to win at both Daytona and Talladega in recent seasons, and of Baldwin’s five lead-lap finishes last year, three came at Daytona, and the other two at Indianapolis and Texas. Stoddard’s drivers had four lead-lap finishes, two at Daytona, one at Talladega and a fourth at Watkins Glen. Even Phil Parsons’ No. 98 Ford driven by Michael McDowell, one of the most frequent start-and-parkers, ran an entire race at both Daytona and Talladega last season. Maybe the question shouldn’t be what to do about start-and park. Maybe it should be what can be done to make every race on the circuit appeal to the “have-nots” as much as the ones at Daytona and Talladega. Tracy, I’m sorry if I gave the impression that I was including Blaney among the start and parkers. My point was that if you start making rules to penalize the underfunded teams, you’ll likely cause undeserved problems for drivers and teams that are trying to work their way up to the elite status. It’s been several years ago now, but I recall hearing or reading that NASCAR was contractually required to start 43 cars. I believe it was the contract with television networks. Any input on that? In the “good old days” of the ’70s & ’80s, the costs to start up a Cup team and race the entire season was considerably less than today. In today’s world, the so-called “lucrative” start money in a Cup race enables a “start & park” team to form, enter and then race as best it can under very difficult funding restraints. If this “lucrative” start money was not available, then the Tommy Baldwins and Phil Parsons of the world would never have materialized and the 43-car starting fields would have gone the way of the Do-Do bird. Also, there is always the potential for a “start & Park” team to eventually evolve into a legitimate and compettive race team over time. It is best to consider the “lucrative” start Cup purse as “seed money” for new and aspiring teams. IMO, Bruton Smith is way off on this one and most likely doesn’t like having to pay such high purse money to these type teams. To a promoter, it is the cost of doing business and having a NASCAR Cup race sanction. Nothing more, nothing less. Maybe the real problem is that it is no longer possible to find enough sponsors to (a) quench the megateams insatiable desire for funding, plus those who want to, for whatever reason, race in Sprint Cup. New sponsors of any substance either go directly to Nascar, or one of the mega teams, not to one of the mid or back packers. Until that changes, and it wont, either live with the S&P’s or restrict the entry list to the number of cars the mega teams are able to field.